I made my own Cheese Cake and then cut it up into pieces and put it in the ice cream maker as the ice cream was churning. 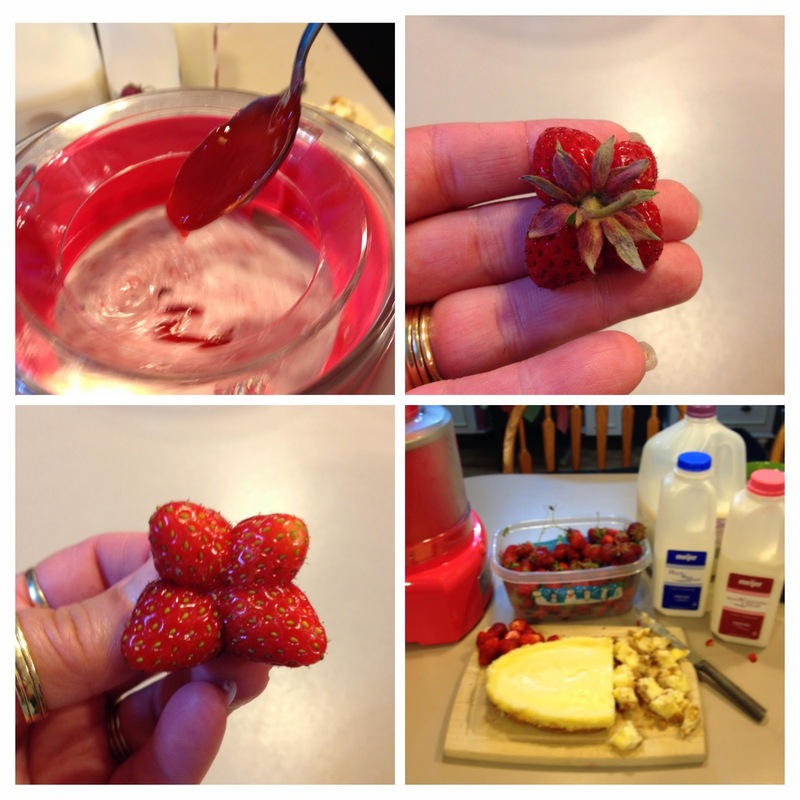 I also made strawberry gel by cooking strawberries, a little water and sugar until I had a juicy mixture. Then I strained the big pieces and seeds out of the juice, put it back on the stove and added some corn starch to thicken it up. I then drizzled some into the ice cream as it churned and then swirled the rest into the ice cream after it was done churning and before I placed it in the freezer to harden. If you want to you could always purchase ready made cheese cake and strawberry gel instead of making your own. In a bowl mix together the ice cream base of whipping cream, half and half, milk, sugar and Vanilla. Put in refrigerator to keep cold. Cut up your strawberries and cheese cake. Pour the ice cream base into your ice cream maker and begin churning according to your makers instructions. When ice cream is about 10 minutes from being done, add the strawberries, cubed cheese cake and half of the strawberry glaze. Churn until the ice cream is done. Pour the ice cream into an air tight container. Drizzle the remaining glaze over the ice cream. With a knife swirl the glaze through the ice cream. Put in the freezer to get hard for 4 hours or overnight. 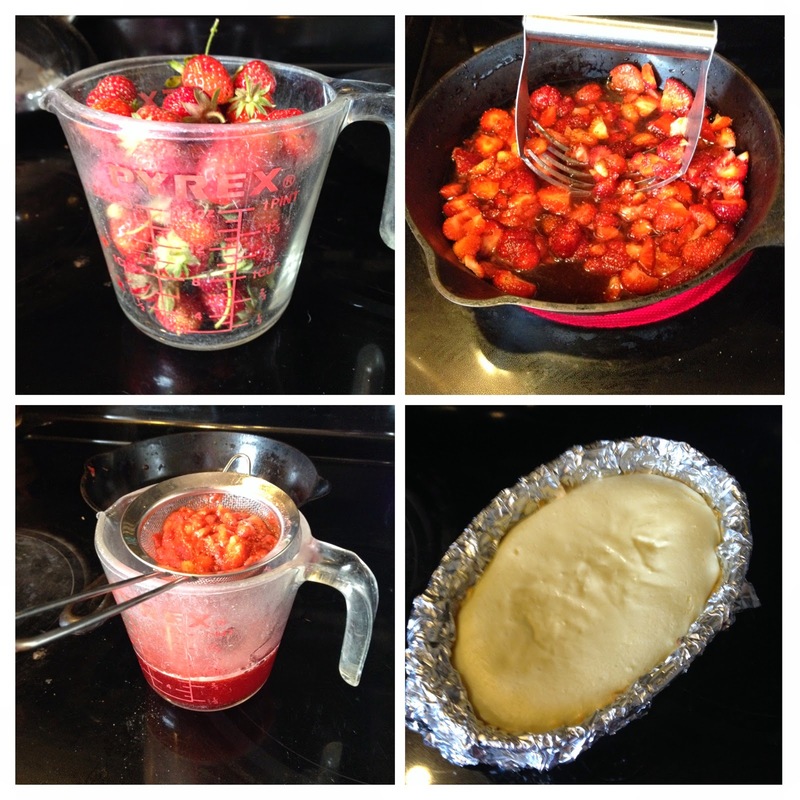 If you want to make your own strawberry glaze this is how I did mine. I took 2 cups of whole strawberries. I put them in a pan over high heat and added 2 T water and 3 T sugar. As they cooked and got mushy, I smashed the strawberries up. I took them off the heat and strained them to get out all the chunks. It left me with strawberry juice. I then cooled the juice. After the juice was cooled I added 1 heaping T of corn starch and placed the juice back on the stove and cooked until the strawberry juice was think and gelled. Mix crust ingredients together and press into a 9" oblong baking dish. Yum! I'm on an ice cream bender since I bought an ice cream maker a few weeks ago. This looks so good. I'm featuring this recipe tonight at our Best of the Weekend Link party at 24 Cottonwood Lane. Thanks so much for linking up with us! Thank you!! 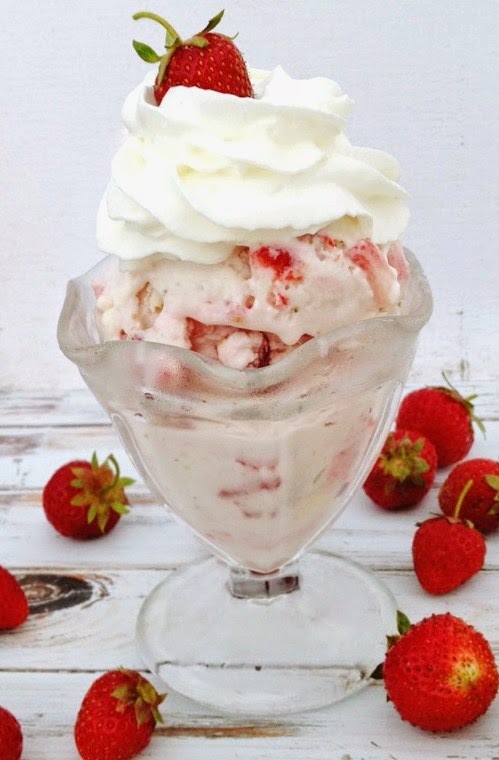 I've been looking for a strawberry cheesecake ice cream recipe that has actual cheesecake chunks in it. It was about impossible, everyone just mixes cream cheese into strawberry ice cream. My quest has come to an end. I'm going to try your recipe later on today, and I'm all for making fresh cheesecake for this. I can't wait!